We met a few weeks after the show for an initial consultation to discuss the demands & possibilities of the system to be built. During the consultation we offered our suggestions for hardware to address the operational criteria of the system. We also offered our suggestions to improve the "use to value" ratio of which audio processors Joe should be using. Joe left our shop with a mountain of information and quest to focus his wishes & criteria. After a few months of deliberation Joe came back to us with his final request list. 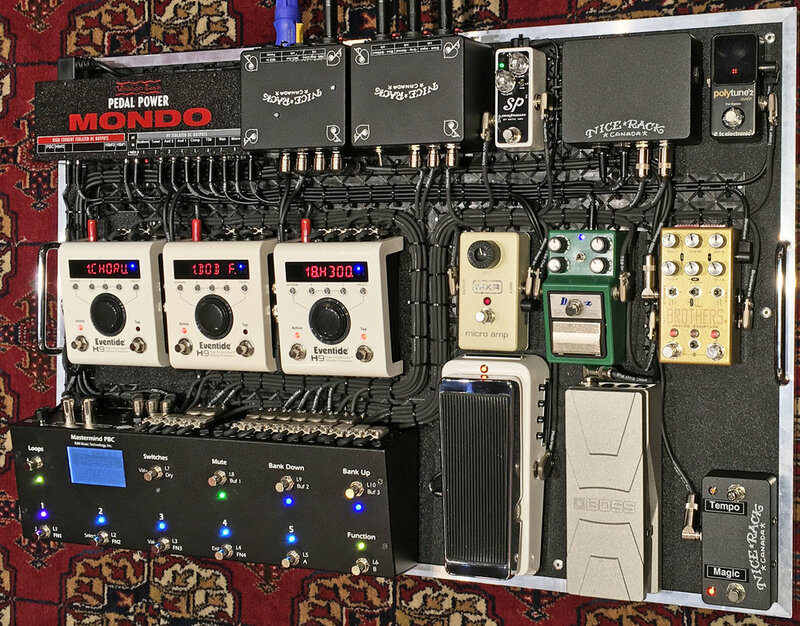 A few weeks later and Joe was back for the last time to collect his pedalboard system that answers all of his sonic criteria and forward potential for creativity. The signal flow is a series wired path through an Xotic Wah with it's lovely input buffer in action, then into a RJM Music MasterMind PBC. Loop 1 is an Xotic SP Compressor. Loop 3 is our first installation of the Chase Bliss Audio Brothers programmable Boost/Fuzz/OD and it's 120 user presets. We expect to install many, many more of this item in future. Loop 4 is a Keeley Modified Ibanez Tube Screamer. Loop 5 is an "Audition" loop where the user can insert a new pedal on the fly to check it out. Loop 6 is the "Post" Connections to Eventide H9#1. Loop 7 is an MXR Micro Amp. Output A is routed to the Vox AC30 Normal Channel. Output B is routed to the AC30's Brilliant Channel. To provide the customer with the greatest amount of Dynamic Control over the system we added a 2 Button External Switch, with one switch globally programmed for Tap Tempo and the 2nd for Per Preset Assignments. We also added a Modified Boss FV30L for use a linear taper expression pedal. Loop #5's "Audition" functionality is achieved through a simple device we built up to offer the user completely flexibility. The audio to & from the MasterMind PBC is routed into our enclosure with Self Normalizing Send & Return jacks to the pedal being "Auditioned". If nothing is patched into the Send & Return jack on our enclosure, then the audio is automatically routed back to the PBC's return. With this functionality the audio path is always complete in the event that the loop is accidentally engaged by the user. In the same enclosure we placed DC input jacks from 2x taps on the Power Supply. With a Series vs Parallel switching circuit the 2x 9VDC taps can be Series connected for 18VDC as necessary or in Parallel for higher current draw pedals. We also included a Polarity Reverse Switching Circuit for either Tip + or Tip - demands. The system is powered by the clean, quiet & rock solid Voodoo Lab Pedal Power Mondo. Nice Rack Canada can help a player through the process of determining what the best hardware for the system, installing it, wiring it & programming it to give the player consistently optimum tone and hassle free performance. We hope you'll be the next to engage our services.